When will indestructible plastics finally degrade? I understand that acrylic, polystyrene and polyester plastics make up most of the growing body of waste plastics in our oceans and they never get broken down but get ingested by ocean life. But we know that nothing persists for ever so surely plastics in the sea have to break down at some point. How long does it take? Hannah - We backed the answer from Mark in Minnesota. Mark - My name Mark Hillmyer and I'm Professor of Chemistry and the Director of the Centre for Sustainable Polymers at the University of Minnesota. Plastics represent an amazing class materials called polymers. These long chain molecules have remarkable properties and as we know, find use in nearly all aspects of our lives. Their broad applicability is due in part of their durability and resistance to degradation. 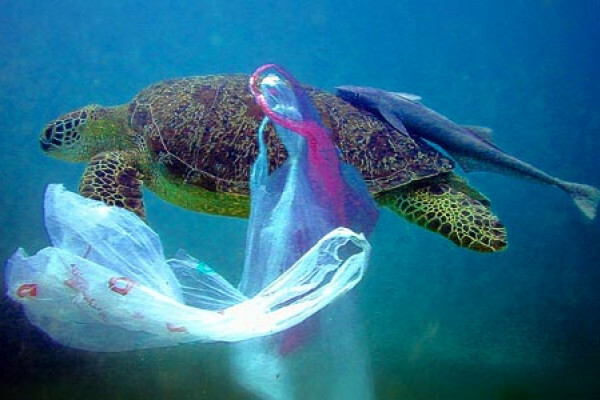 However, this resistance to degradation is one of the pitfalls of plastics when they end up as trash in our environment. Unfortunately, a large quantity of our plastic trash ends up in the ocean and negatively impacts ocean life and the health of our ecosystems. Scientists and engineers across the globe are now grappling with this daunting environmental issue. So while you might think they would quickly corrode, dissolve or otherwise be broken down soaking in our oceans, this is not the case. Most plastics are made from simple oil derived compounds and thus are very hydrophobic or water hating. In fact, plastics that have lived their useful life decades ago have been found floating in the pacific ocean, providing compelling evidence for their robust nature. Eventually, plastics that do end up in our oceans will break down through mechanical abrasion, oxidative degradation and other chemical, and sometimes biochemical processes. But this can take literally 100 years or more, depending on the specifics of their chemical composition. Making the situation worse, plastics are generally resistant to sunlight. Next generation polymers are being designed to be durable and used but readily broken down after disposal. Getting away from petroleum starting materials and generally new plastics that do not present such environmental hazards are important sustainability challenges in the world of polymers. Hannah - And what happens to all of this plastic floating around in our oceans? Richard Thompson, Professor of Marine Biology at Plymouth University explains his experiments. Richard - I work with common mussel, Mytilus edulis which is the same species as you'd have with mussels in chips if you like - moules frites. We've shown the work with them that if you give them a false exposure to small pieces of plastic in the laboratory, you move them to clean conditions where there's no plastic, even 40 days later, some of those individuals have still got plastic in their gut. So there's clear evidence that a range of creatures, a range of small invertebrates are eating plastic, and indeed are retaining that material. Previous Can we re-use the ash from burning waste? Next Are primary colours in pigment and light different?